The incident took place in proximity of the Kerch Straits, the narrow maritime entry from the Black Sea to the Sea of Azov. Since the union of Crimea with Russia in March 2014, the entry into the sea of Azov is fully controlled by Russia. (see image below). Will the Kerch Straits Incident lead to a process of military escalation? In recent developments (November 26), Russia has reopened the Kerch Strait to maritime navigation. The union of Crimea in 2014 with Russia redefines both the geography as well as the geopolitical chessboard in the Black Sea basin. It constitutes a major setback for US-NATO, whose longstanding objective has been to integrate Ukraine into NATO with a view to undermining Russia, while extending Western military presence in the Black Sea basin. 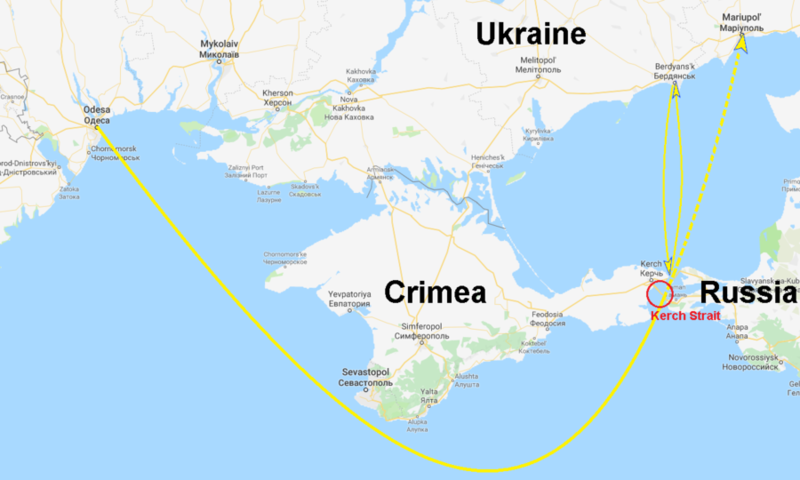 Under the agreement between Russia and Crimea announced by president Putin, two “constituent regions” of Crimea joined the Russian Federation: the “Republic of Crimea” and the “City of Sevastopol”. Both have the status of “autonomous regions”. The status of Sevastopol as an autonomous entity separate from Crimea is related to the location of Russia’s Naval base in Sevastopol. Since the break-up of the Soviet Union, Russia retained its naval base in Sevastopol under a bilateral agreement with Ukraine. With the signing of the March 18th 2014 Treaty, that agreement is null and void. Sevastopol including the Russian naval base become part of an autonomous region within the Russian Federation. 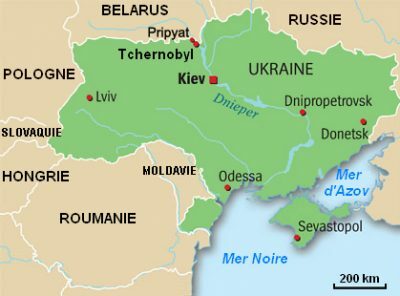 The naval base is no within Ukraine under a lease agreement. Moreover, Crimea’s territorial waters now belong to the Russian Federation. Following the union of Crimea to Russia now controls a much larger portion of the Black Sea, which includes the entire coastline of the Crimean peninsula. The Eastern part of Crimea –including the Kerch straits– are under Russia’s jurisdiction control. On the Eastern side of the Kerch straits is Russia’s Krasnodar region and extending southwards are the port cities of Novorossiysk and Sochi. Novorossiysk is also strategic. It is Russia’s largest commercial port on the Black Sea, at the cross-roads of major oil and gas pipelines between the Black Sea and Caspian sea. Historically, the Kerch strait has played a strategic role. 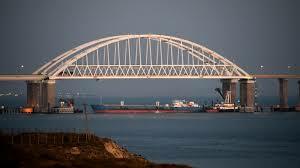 It constitutes a gateway from the Black Sea to Russia’s major waterways including the Don and the Volga. During World War II, the Kerch peninsula occupied by Nazi Germany (taken back by the Red Army) was an important point of transit by land and water. In the coldest months of Winter, it became an ice bridge linking Crimea to the Krasnodar region. The Kerch strait is about 5 kilometers in length and 4.5 km. wide at the narrowest point between the tip of Eastern Crimea and the peninsula of Taman. Kerch is a major commercial port linked to railway, ferry and river routes. Of significance, the integration of Crimea into the Russian Federation means that Moscow is now in full control of the Kerch Straits linking the Black Sea to the Sea of Azov. The Ukrainian authorities are no longer in control of the port of Kerch in Eastern Ukraine. The bilateral agreement between Russia and Ukraine governing the maritime route through the Kerch straights was scrapped. 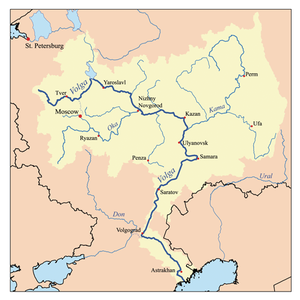 The straits also constitute an entry point into Russia’s major river waterways. The Sea of Azov connects with the Don River and the Volga, through the Volga Don Canal. In turn, the Volga flows into the Caspian sea. The Kerch straits are strategic. The Kerch-Yenikalskiy Canal allows large (ocean) vessels to transit from the Black sea to the Sea of Azov. Moreover, the Kerch Strait links the Black Sea to the Volga which in turn connects to the Moscow river through the Volga-Moskva canal. In December 2013 Moscow signed a bilateral agreement with the Yanukovych government in Kiev pertaining to the construction of a bridge across the Kerch Strait, connecting Eastern Crimea (which was part of Ukraine) with Russia’s Krasnodar region. This agreement was a followup to an initial agreement signed in April 2010 between the two governments. The Russia-Ukraine 2013 agreement pertaining to the construction of the bridge had, for all purposes already been scrapped before March 16, 2014. Crimea’s union to Russia was already in the pipeline prior to the referendum, it was a fait accompli. Less than two weeks before the March 16 Referendum, at the height of the crisis in Ukraine, Russia’s Prime Minister Dmitry Medvedev ordered the state-road building corporation Avtodor, or “Russian Highways” “to create a subsidiary company that will oversee the building of a bridge across the Kerch Strait”. The Kerch bridge inaugurated in May 2018 is under Russian ownership and control. The Kerch strait is within Russian territorial waters on both sides of the strait. Copyright © 2018 Centre for Research on Globalization, All rights reserved. Nächster Beitrag → Scharmützel im Asowschen Meer – Neuauflage der Maidan-/Krim-Krise?